Today I got that special screwdriver I needed to be able to open up the Gameboy. The tool is called a Philips Triwing and it can be used to unscrew other Nintendo things as well. Alas my old original, yellowed Gameboy is now open and ready for some serious fixery. 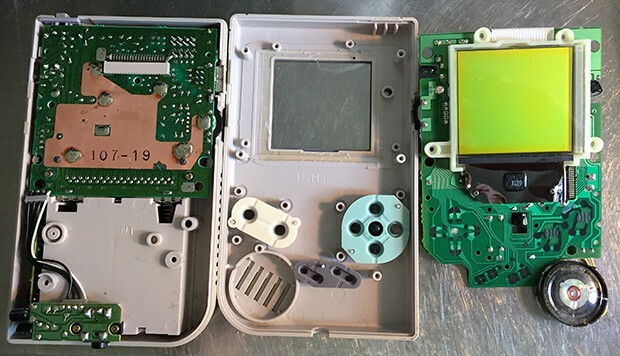 I’m planning to do three things: Fixing the D-pad, fixing the dead pixels on the screen and soldering a new line-out to improve sound quality. Update: The plastic thing under the D-pad was broken so I had to order replacement parts. While I wait for that to arrive from Hong Kong I decided to do the Prosound mod on my Gameboy Color instead. It was pretty simple and took maybe one hour and a half from start to finish. It sounds a bit better now so I will start to make some Nanoloop noises on it and upload to Soundcloud.